NASHVILLE, Tenn. – Country music icon Trace Adkins, independent rising country music artist Dillon Carmichael, and country rock duo The Sisterhood Band have been added to the incredible music lineup for Hometown Rising, the first-ever Country Music & Bourbon Festival, which debuts Saturday, September 14 and Sunday, September 15 at Highland Festival Grounds at KY Expo Center in Louisville, Kentucky. Hometown Rising combines two of Louisville’s cultural cornerstones—great music and incredible bourbon—and is the newest addition to the Louisville fall festival series from premier independent festival producer Danny Wimmer Presents. 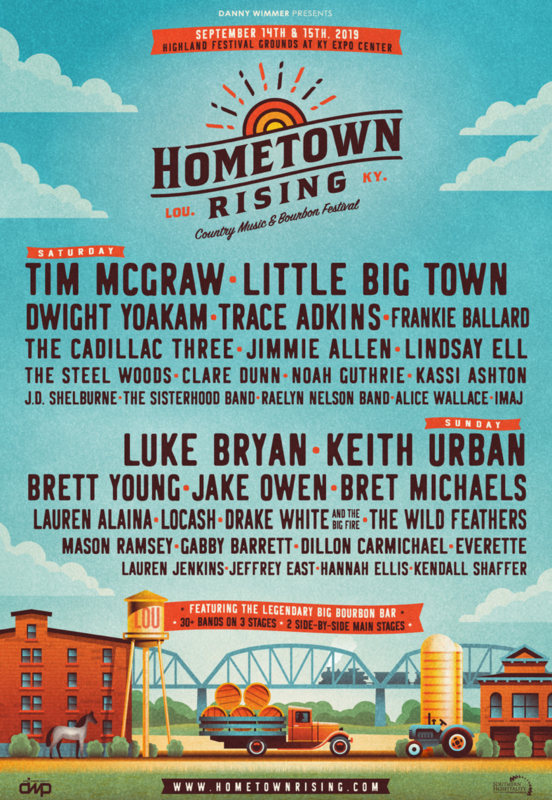 Hometown Rising’s music lineup will be led by country heavyweights including Tim McGraw, Little Big Town, Luke Bryan and Keith Urban with additional appearances from Dwight Yoakam, Trace Adkins, Brett Young, Jake Owen, Bret Michaels, Frankie Ballard, and many more. In total, more than 30 artists will play on three stages, including two side-by-side main stages, over the course of the weekend. Hometown Rising exclusive VIP packages, General Admission tickets, camping and hotel packages, as well as special event tickets are on sale now at HometownRising.com. With three back-to-back festival weekends in Louisville in 2019, Danny Wimmer Presents wants to ensure all fans have the chance to enjoy multiple events with an affordable and convenient ticketing option. New this year, fans can purchase a special “Trifesta” Pass for the discounted rate of only $229.00 plus fees. The pass allows General Admission weekend access to all three DWP fall festivals in Louisville—Hometown Rising (September 14 & 15), Bourbon & Beyond (September 20-22) and Louder Than Life (September 27-29). Check out trifestapass.com for more information. Hometown Rising sponsors include: Kentucky Department of Tourism, Louisville Tourism, Fxck Cancer / Dyin 2 Live Dreams Program, Jack Daniel’s, Tito’s Handmade Vodka, The Music Experience, Zyn, Take Me Home, and more. The Highland Festival Grounds at KY Expo Center are located at 937 Phillips Lane in Louisville, Kentucky. Hometown Rising is produced by Los Angeles-based Danny Wimmer Presents, one of the largest independent producers of destination rock music festivals in America. DWP events include Aftershock Festival, Bourbon & Beyond, Chicago Open Air, Epicenter Festival, Hometown Rising, Louder Than Life, Sonic Temple Art + Music Festival, and Welcome To Rockville.